Your oil painting guide to critiquing your own work. An Oil Painting Guide to critique your own work. An oil painting guide on how to critique your work, Part II is below. OK, You’ve looked at your painting and decided the first group of questions in Part I of this series have you pretty much ready to frame and ship your work to the gallery. Lets take one more look though with the bad things that may not readily stand out, but will hurt your chances at that first prize or sale of your masterpiece. Oil painting guide in critiquing your work part 2. Go through this list, even better, ask a fellow artist to work through the list with you. One that you trust, but doesn't mind giving you the truth! Inaccurate drawing? Is there something in your painting that doesn’t make sense. Can’t fit the logic of normalcy? Tilted horizon on the still life shelf? 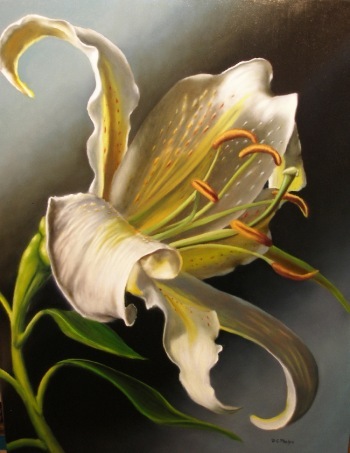 (7 petals on the Lily kind of thing)? This painting below sat in the gallery for a bit before the thing that was bugging me hit me while reviewing photographs of the work. Can you tell me what is wrong with the painting? I'll give you the answer below in the follow up photograph. The painting was reworked in order to fix this error. The issue became apparent when reviewing the reference photo, and seeing the multiple blooms had intertwining petals. No one noticed it, but in the future, a real Lily lover would have picked right up on this boo-boo. Lack of originality/imagination? Is the subject trite, dull? No punch to it? Element Discrepancy? Have you painted the snow leopard in a jungle environment? Style and Quality Discrepancy? 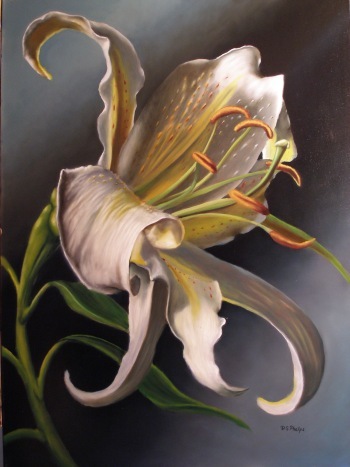 Have you started a realistic work, and resorted to abstract or impressionistic elements that seems out of place. Great looking mountains, but the Elk need lots of work? Mood, feeling or message conveyed? Is it a dead painting? Or is there life within it! Plagiarism? Have you copied another’s work, photograph, and presented as your own? Poor Presentation? Paint bulges, brush hairs, scratches, bad framing, fingerprints, poor varnish coating, etc. Keep good records! I know you keep an art journal. 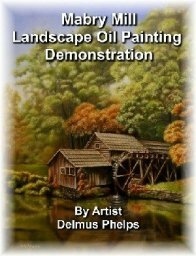 Use it as your own oil painting guide! This is a great way to keep track of your overall progress as a painter. Once you’ve gone through all these questions, take a picture of your work and paste it into your album. Any thing that stands out in the negative arena, make note of it within the journal. Any thing that stands out in your mind that you know you did right, enter it in your journal. In this way, you will be able to see the progress of your work as the years go by. You will be reminded of mistakes and how to avoid them in future work. No one needs to see your personal critiques. It’s like a dairy. Just for you! Click here to leave this Part II oil painting guide and see part I.